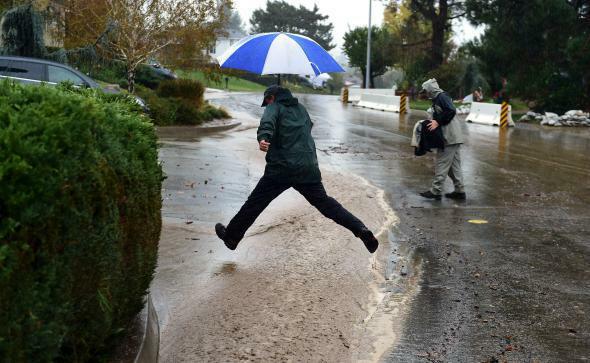 Pineapple express: Drought-stricken California is finally getting some serious rain. Rejoice, California! It’s Pineapple Express Time. Last week featured the heaviest rains in the Bay Area in 1,876 days. This week’s storm should be even bigger. Still, last week’s rain didn’t do much to help the drought—technically, nothing changed at all. But it did set the stage for the coming storm to be a big help. Since the ground is still wet in most places, more will runoff into streams and reservoirs this time around. The rain is coming thanks to an eastward shift in the rain-blocking ridge that dominated the Pacific Coast last winter and helped intensify the drought. That shift is helping to open the door for major storms to approach the state from the tropics. No matter how much rainfall the storm brings, this year’s heat will have already left its mark. Amid controversy over the drought’s place in climatological history, there’s now a 100 percent chance of 2014 becoming California’s warmest on record. *Correction, Dec. 9, 2014: Due to an editing error, this post originally included the wrong date for recent rainfall. It occurred Dec. 3, not Nov. 3.